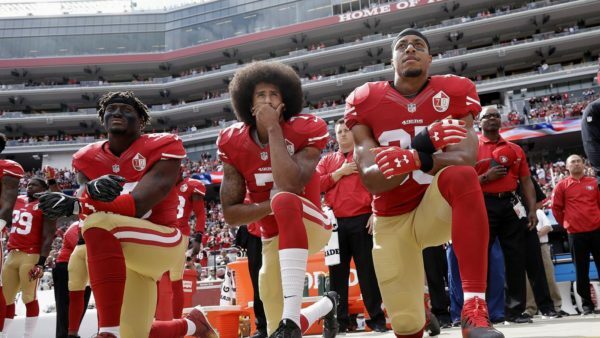 Whether or not you’re an avid social media or TV news follower, you’ve heard about this “scandal.” This controversy surrounding the “taking a knee” movement throughout the NFL in recent months — though it’s really taken off in most recent weeks. 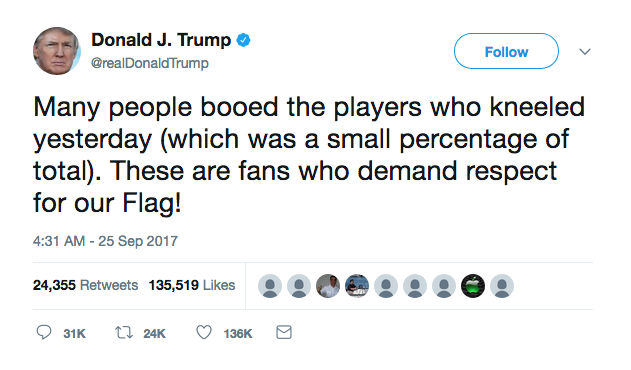 Stated from the very beginning was the point he was trying to make: his sitting during the national anthem and presentation of the flag had nothing to do with disrespect or some kind of showing disdain for the country — no, it was about bringing attention to the massive, pervasive issue of violence and unfair treatment of minorities, specifically African Americans. 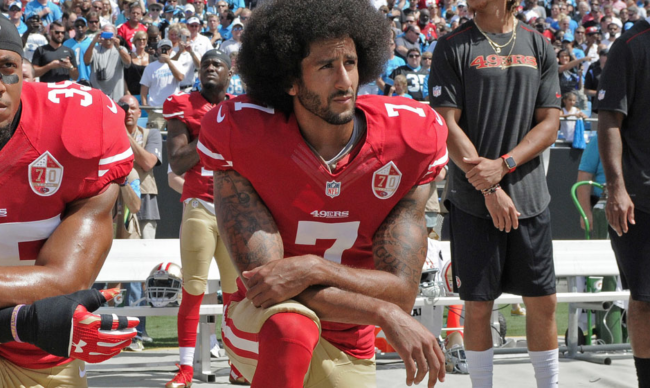 With the onslaught of police violence against black citizens, sparking the pivotal #blacklivesmatter movement, Kaepernick knew that as a black man in a position of celebrity and limelight, he could bring more attention to the issue in an effort to influence discussion. “I have great respect for the men and women that have fought for this country. I have family, I have friends that have gone and fought for this country. And they fight for freedom, they fight for the people, they fight for liberty and justice, for everyone. That’s not happening. As a black man in a position of authority regularly covered by the media, he still faces scrutiny because of the color of his skin, despite being lauded as a talented football player. In a sport where black players still have to fight to play certain team positions, a sport where racial diversity is still a trial faced from college and onwards (don’t even get me started on the way women are excluded from professional sports), it’s understandable that even this man, with his attained wealth and fame, is familiar with hardships faced by African Americans and other POCs in this country. 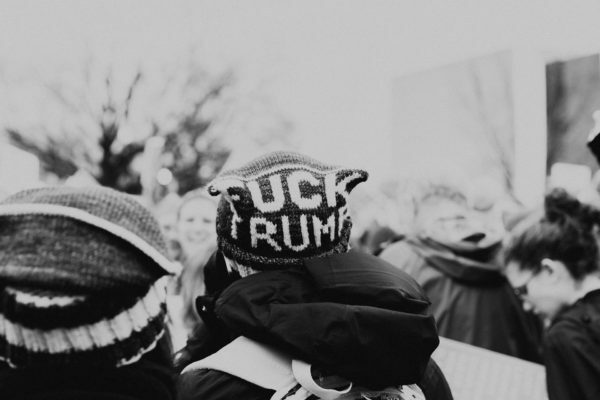 Wealth does not set him apart, popularity and celebrity status doesn’t mean he’s treated any differently from those of a lower socioeconomic class — but he knows that it does mean he’s better equipped to bring attention to these issues. “In early 2016, I began paying attention to reports about the incredible number of unarmed black people being killed by the police. The posts on social media deeply disturbed me, but one in particular brought me to tears: the killing of Alton Sterling in my hometown Baton Rouge, La. This could have happened to any of my family members who still live in the area. I felt furious, hurt and hopeless. I wanted to do something, but didn’t know what or how to do it. All I knew for sure is that I wanted it to be as respectful as possible. One detail most people probably don’t know is that the idea to kneel rather than just sit to make a point was suggested by Nate Boyer, a former NFL player and retired veteran. He explained that soldiers kneel in respect before a fallen soldier’s grave, and by mimicking the pose, they would be sending a much stronger message. Trevor Noah, host of the Daily Show, goes into more detail. His comments including Nate Boyer begin around the 7:00 minute mark, though I highly recommend watching the entire video for an overall summary of everything going on (especially if you need some good, cynical laughter in your life). Trevor Noah’s points mostly surround the comments made by Donald Trump on the issue, which are, as expected, ignorant and infuriating. Now, I don’t really want to get into the issue of what’s considered respectful/disrespectful in terms of the American flag (many, many people have already made valid and satisfying points, including this Twitter thread that had me both laughing and feeling frustrated at the hypocrisy in this country), but what I do want to get into is this sudden, vocal white-knighting of the American flag. He reminds the hosts that Martin Luther King Jr. was a patriot, Susan B. Anthony was a patriot, and what Kaepernick is doing now makes him a patriot. Of course I believe the flag and the national anthem deserve respect, they represent this country I live in, and while I don’t always love it, I want to be here to support her through the good and the bad. I think that’s fair to say for all American citizens. Kaepernick’s (amongst others joining to take a knee in recent weeks) is the most peaceable method protest to come out of this unrest. 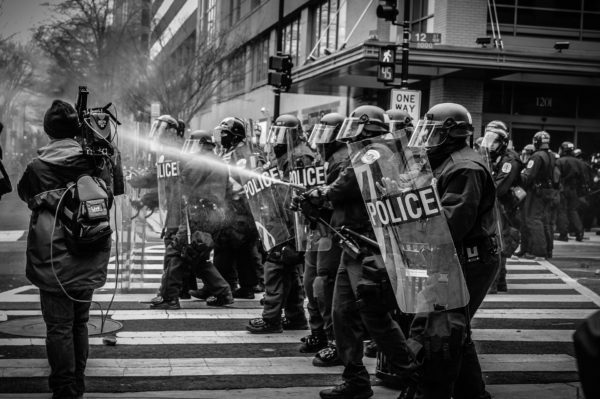 While marches for Black Lives Matter have always intended to be the same, and most were, it wasn’t unusual for a few to become violent — though all of that came on the backs of more and more police resistance, brutality, and the attempted silencing of marchers — only further proving their point, that the most police aren’t there to protect black lives and rights. His taking a knee isn’t about the flag, just as how with Rosa Parks, it wasn’t about the bus. Hell, it isn’t even about veterans — it’s the right-wing media, voters, and politicians that are making it about all those things, rather than acknowledging its real purpose: to shine light on Kaepernick, an influential person with a wide social reach, and ergo shine light on the issues he’s trying to bring more attention to: the treatment of people of color in this country. To shine light on police brutality, on the killing of young, innocent kids. 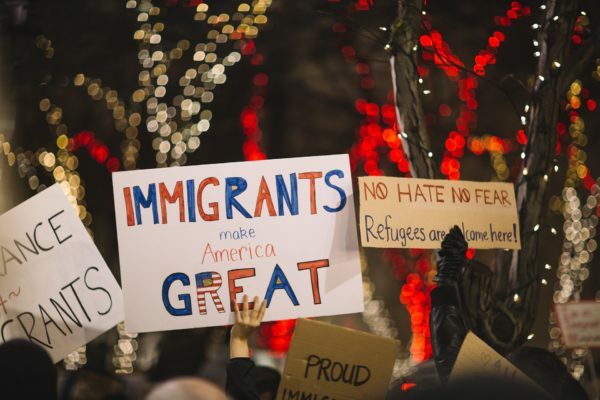 It isn’t about Donald Trump, it isn’t about patriotism, it isn’t about starting a black vs. white race war — it’s about the unfair treatment of specific American citizens, founded only on the color of their skin. The skin they were born with, in a country to which their ancestors were either brought to be enslaved, or those who fled to in search of a better life. 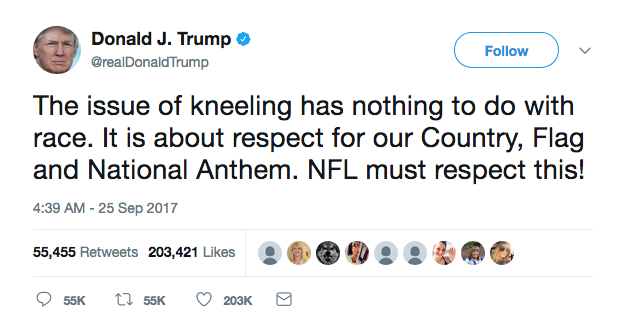 From now on, rather than focusing on dispelling whether or not he’s a terrorist, disrespecting veterans, or protesting Trump, we need to be emphasizing the true meaning of what “taking a knee” stands for: speaking out against police brutality and the overall unjust treatment of POC, from both institutions and the privileged class. 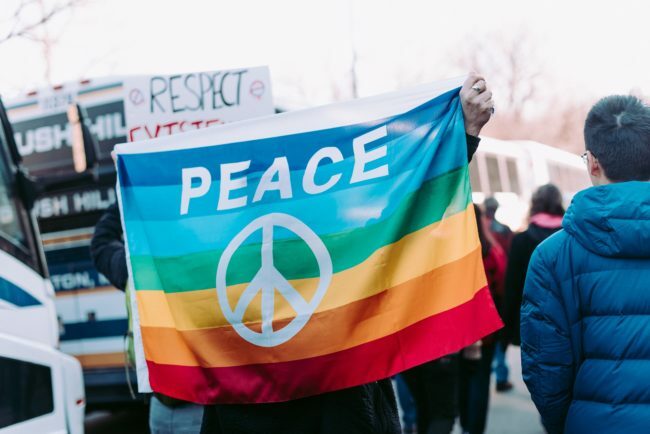 That includes speaking out against the institutionalized racism that still runs rampant in this country, even if it isn’t as vocal as before the Civil Rights Movement. 45 percent of companies in the US have no minorities/POC on their executive teams. Flint, Michigan, a town made up of 60 percent poor African American citizens, hasn’t had lead-free water since February 2015, in a basic American infrastructure that will only continue to fail and harm similarly small and poor communities. In 2015, black men were nine times more likely to be killed by police than other Americans. All of this, the marches, the protests, coming on the backs of black victims like Trayvon Martin, Tyre King, Eric Garner, Jordan Edwards, Tamir Rice. The unjust treatment of black and other POC in this country is undeniable. Privileged people will make excuses, will make justifications, but the fact of the matter is, people are still dying. Black people, young black children, at rates more rampant than their white counterparts — and anyone with open eyes knows why. This country was built on racism. It was built on the backs of black slaves, and we still struggle to contain the ripples left behind on our culture. The fact is, the treatment of POC in this country won’t change until those in power — the wealthy, the privileged — take responsibility for the treatment of POC, and acknowledge the suffering. Publicly, indiscriminately, and without excuses. It’s time for America to remember what she was built on, the ideals and dreams that came and contributed to her diverse culture. It’s time for her to take responsibility for her past atrocities, to make amends with the people she’s damaged, and only then can she move forward without stumbling. 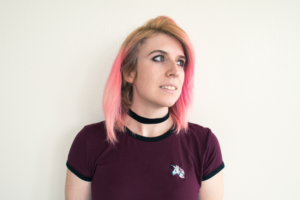 Nico Morgan is a freelance writer from Idaho, where she spends most of her time writing, drawing, and plaiting tiny braids into the fur of long-haired cats. You can find more of her daily one-liners on twitter, @holobun. Pingback: Nike Intentionally Jumps into Kaepernick Controversy – A Savvy Marketing Play?